It's clear that there have been widespread protests in Iranian cities, although their size and extent are hard to judge from the available information, as well as an ongoing government crackdown against actual and potential opposition. => Andrew Sullivan (at his "Daily "Dish" blog) and Nico Pitney (at the Huffington Post) have been posting a steady stream of photos, video clips, and other reports reports from (and about) Iran. It's worth checking their blogs for updates. => Talking Points Memo has a slide-show of protests in Iran HERE. Reports from students in Tehran say that the universities and polytechnic institutes have been closed for the next few days. This step was obviously taken to prevent students from gathering and demonstrating on campus. Many shopkeepers have closed up shop. Mir-Hosain Mousavi's protest letter is here. On Saturday, thousands of pro-Mousavi protesters staged sit-down strikes, started fires in metal trash bins, and confronted police and Islamic Republic of Iran paramilitary forces, pelting them with stones. 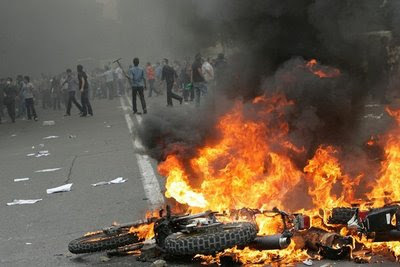 Riot control police were sent in on motorcycles, in heavy gear. Toward midnight Saturday, tear gas canisters were being lobbed at the thinning ranks of protesters, with at least one hit in the head and wounded by a canister. Observers in Iran said that Facebook was taken off line and that even cell phone service was interrupted. The demonstrations did not only take place in Tehran, as some observers have charged, but were also staged in parts of other cities (I've seen Tabriz and Rasht cited). Iran's repressive forces are powerful and they may get away with staging a stolen election for now. But the regime's credibility has definitely taken a hit. Violence and acrimony over Iran’s disputed election intensified on Sunday, with word spreading that more than 100 prominent opposition members had been detained, riots erupting in Tehran and other cities, and the triumphant incumbent hinting that his top challenger risks punishment for questioning the result. Mr. Ahmadinejad’s electoral rivals appeared to be holding firm in their protest against the vote despite the arrests and a mass crackdown on street protesters by the police and Basij militia members, many of them wielding batons, whips and chains. Nationwide protest movements in 1999 and 2003 trailed off after a week or so. In a statement, Mr. Moussavi said he had asked the Guardian Council of Iran, which must certify the election for it to be legal, to cancel the vote. He also said he was being monitored by the authorities and was unable to join his followers. His campaign headquarters has been shuttered, he said. Whether this unrest proves to be transitory or escalates further remains to be seen.